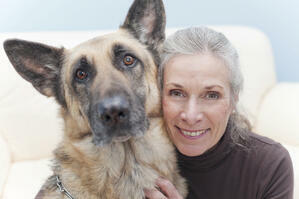 For seniors that live alone, pets can provide valuable emotional support and increase the quality of life. The type of pet that may best benefit an elderly individual depends on the ability of the individual to take care of the pet. For many, cats or smaller animals may provide company without the need for regular exercise that dogs require. Even fish may provide a welcome distraction from daily worries and help to promote positive emotions. Having an animal to take care of can provide seniors with a sense of purpose that may be beneficial to cognitive functions. Animals need food and water daily, so seniors will often feel an obligation to remember to provide those things at a certain time each day. Seniors may also need to clean the fish tank or cage, depending on the type of animal that is acquired. For seniors with few other obligations, having to remember to perform these functions can help to exercise cognitive functions. Animals that can provide affection can be a great source of comfort and emotional support. Dogs and cats are generally in tune with owners’ moods and may snuggle when the person is sad or afraid. Animals can also help to ease the tension when guests and family members that may be uncomfortable come to visit, as they give guests something to talk about with seniors. Playing with the pet can also provide entertainment and comic relief. Dogs and animals that must be exercised outside of the home may help seniors to develop social connections with other animal owners. Seniors that adopt animals are often inclined to take better care of themselves because their animal is counting on them. It is not unusual for seniors to experience improved appetite and other physiological improvements after adopting an animal. Blood pressure and stress levels are generally lower for senior citizens with pets that for senior citizens that do not own pets. The responsibility of regularly walking a dog, playing with a cat, or cleaning up after a caged animal or fish can also promote frequent exercise. The increased activity levels can help to improve conditions and overall physical health. There are many benefits of pet ownership for seniors, but seniors may need a little hand with pet care. In-home caregivers can help seniors with light pet care duties, such as cleaning up after the pet or feeding time reminders. Caregivers can also accompany seniors with walking a dog or take over walking responsibilities when conditions are adverse. Although seniors should be careful not to adopt a pet that requires extensive care beyond their abilities, caregivers can help with some responsibilities when necessary.